The School of Education’s Landscape of Urban Education Lecture Series continues on Sept. 25 with “Stepping up to the Plate: Fixing School Food in America.” This talk will be presented by Janet Poppendieck, professor emerita of sociology at Hunter College, City University of New York, and director of public policy at the New York City Food Policy Center at Hunter College. The lecture is at 4 p.m. in the Public Events Room, 220 Eggers Hall, and is free and open to the public. CART services will be provided. Free parking will be available in the University Avenue Garage. This event is co-sponsored by Maxwell School‘s Department of Geography and Falk College‘s Department of Public Health, Food Studies and Nutrition. Poppendieck is the author of “Breadlines Knee Deep in Wheat: Food Assistance in the Great Depression” (Rutgers: 1986), “Sweet Charity? Emergency Food and the End of Entitlement” (Viking, 1998, Penguin, 1999) and “Free For All: Fixing School Food in America,” (University of California Press, 2010), which received the 2010 Book of the Year award from the Association for the Study of Food and Society. She received an undergraduate degree in history from Duke University and master’s and Ph.D degrees from the Florence Heller Graduate School for Advanced Studies in Social Welfare at Brandeis University. Her primary concerns, both as a scholar and as an activist, are poverty, hunger and food assistance in the United States. 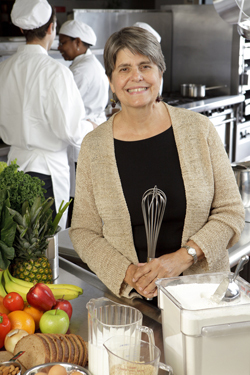 She is a recipient of a 2011 James Beard Foundation Leadership Award.